Custom shower pans make building a shower so much easier. 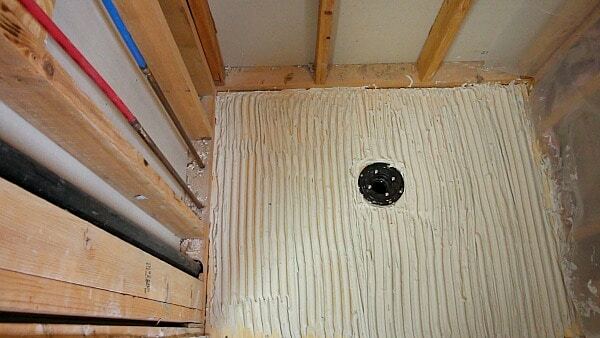 Recently Steve had to remodel a bathroom that had a leaky fiberglass shower pan. The prior installer did a poor job and the homeowners stopped using the shower after water leaked into the kitchen ceiling. 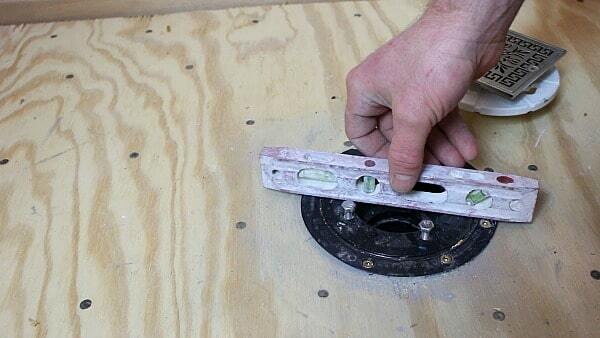 Today share how to install KBRS’s Tile-Basin® shower pan. Any DIYer can do this project in just a few hours and with minimal tools. Many homeowners have shower pan leaks. Catastrophes happen because either a DIYer or contractor did sloppy work. 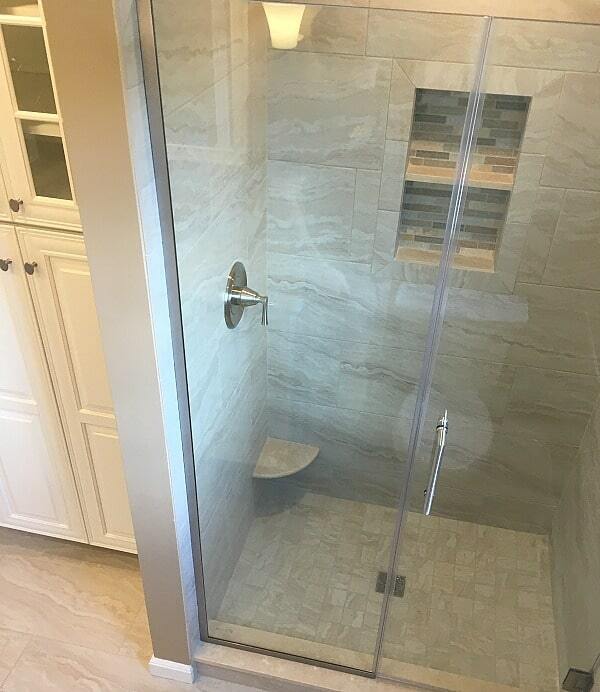 We all make mistakes but one small oversight during a shower remodel can lead to expensive repairs. After extensive research we decided the KBRS Tile-Basin® would be a good fit for one of Steve’s clients. First off, there are no seams in the pan. Plus, KBRS manufactures it to a custom size, shape, and drain location. Then they waterproof everything before shipping the pan. This means there’s a warranty for the homeowner and the installer. And the pan is 100% waterproof when it gets to the house. Furthermore, installation time is only a few hours and that saves money for the homeowner!! What are the first steps for installing the Tile-Basin®? For this project we had 1/2″ plywood over 16″ on-center joists. We added a 1/4″ layer of plywood to the 1/2″ layer using 16d penny nails and liquid nail in an ‘S’ pattern for extra strength. 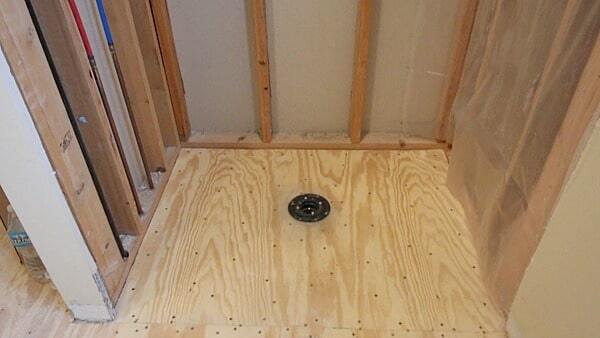 The Tile-Basin® requires 3/4″ wood subfloors, and that’s the reason we added the extra 1/4″ layer. 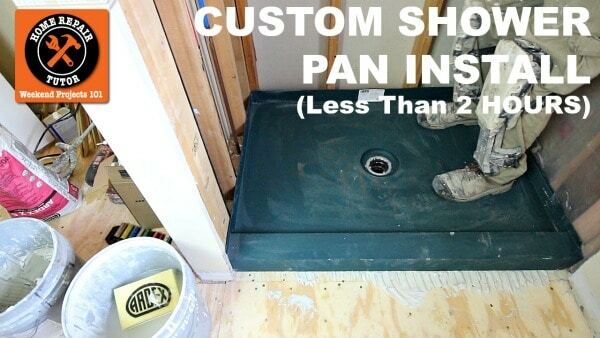 That said, this shower pan can also be installed over concrete subfloors in basement bathrooms. Since wood subfloors expand and contract, you should never set tile directly on them. Isolation membranes like DITRA or DITRA-HEAT should be used to protect tiles from cracking. DITRA was used in this bathroom. 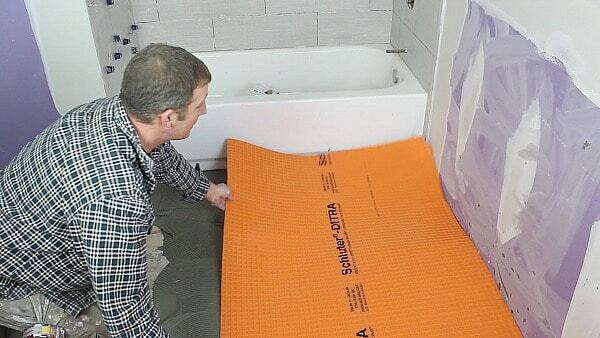 We followed the Schluter directions for that installation. Mud pans are cheap to install. Yet, getting the 1/4″ per foot slope can be a challenge. And this leads to puddling or improper draining of the water – which in turn can result in mold or mildew in the shower. KBRS’s custom Tile-Basin® shower pans are pre-sloped, which eliminates puddling. And the Tile-Basin® uses standard shower drains. Most plumbers will be familiar with these drains, and that’s good if you decide not to install it yourself. 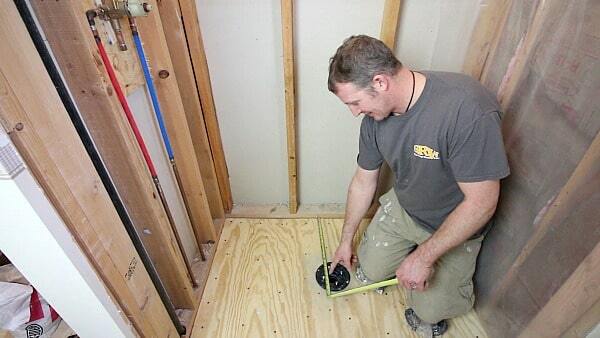 The drain needs to be level with the subfloor for the Tile-Basin® to work properly. Identify the type of pipes in your home, e.g. this house had ABS pipes. Then choose a drain that matches the pipe material. Cut a 4 1/2″ hole for the drain. And make sure the studs for the screws fit down in the hole. This helps the drain be flat against the subfloor. How do you glue the drain to the pipe? Installers need to determine the height of the pipe coming out of the floor, and glue the drain to that pipe such that the drain sits flush with the subfloor. We explain in the video how to get the dimensions for the Tile-Basin®. Set the drain first. This is very important. Our shower alcove was 48″ wide by 36″ deep. We subtracted 1/2″ from these dimensions to get 47 1/2″ and 35 1/2″ respectively. 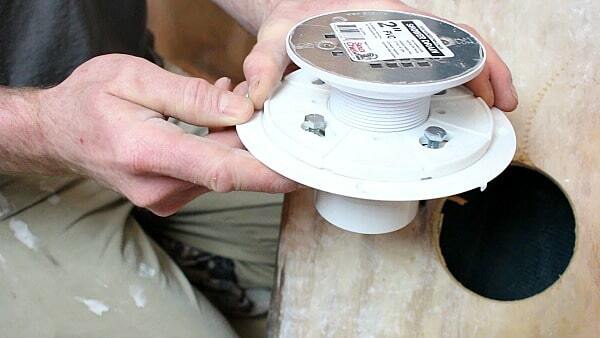 Place the measuring tape on the stud and measure to the center of the drain. Then subtract 1/4″ from this dimension. For example, our measurement from the stud to the center of the drain was 15 3/4″. We subtracted 1/4″ to get 15 1/2″. The center of the drain was 24″ from the mixing valve wall. We subtracted 1/4″ from this dimension and got 23 3/4″. These four measurements are needed by KBRS to make the pan the right size and to place the drain in the correct location. 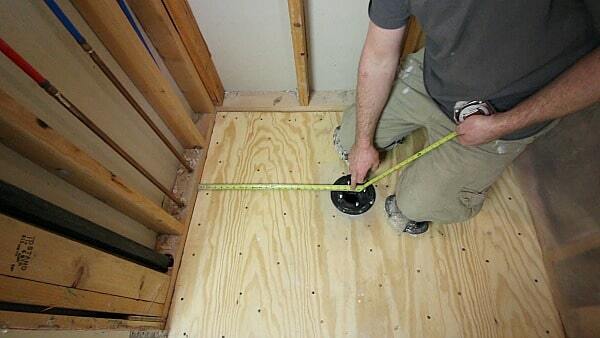 The 1/4″ off each wall will give you some wiggle room to dry fit the pan. These are KBRS directions for measuring the Tile-Basin®. Wood subfloors need to be clean before applying thin-set. Wipe off the subfloor with a damp sponge. Then burn thin-set into the subfloor with the flat size of a trowel. KBRS requires a 3/4″ U-Shaped trowel for the Tile-Basin®. Fortunately they give you a plastic version with the pan. Directionally trowel all the thin-set in the same direction on the subfloor. 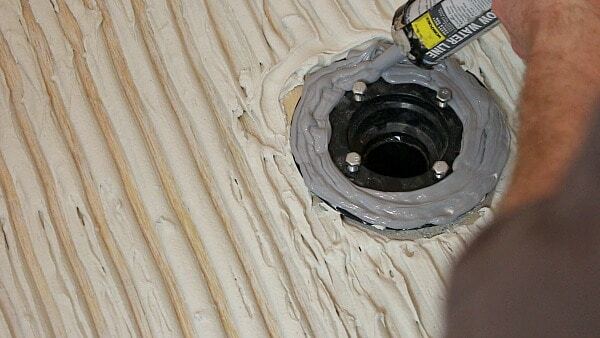 Then apply two to three thick beads of KBRS polyurethane sealant on the shower drain. Finally, embed the Tile-Basin® onto the thin-set and walk on it to compress both the thin-set and the polyurethane. 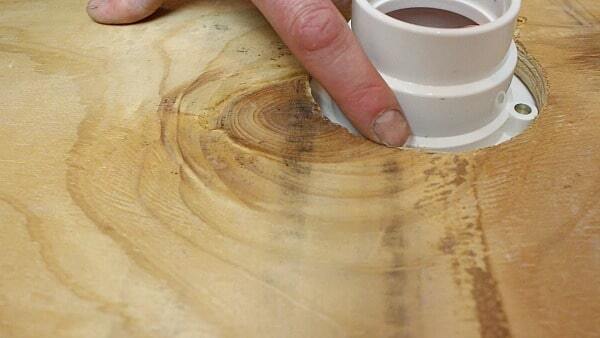 The last step is to add the clamping ring to the top of the Tile-Basin®. 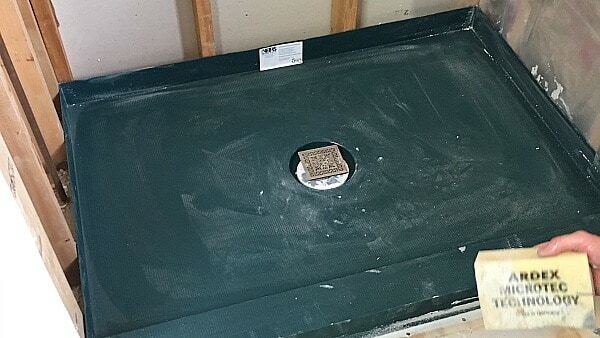 That’s pretty much all there is to installing Tile-Basin® custom shower pans. It’s very simple and there are no nails required in the outside flange. The next step is to add 1/4″ furring strips to the studs in the shower. This allows the backer board to hang down into the Tile-Basin® and be sealed to the pan using the KBRS PolySeal® sealant. We’ll show you how to do that in a future tutorial. Watch our video to see step-by-step how to install the Tile-Basin® in less than two hours. Here’s a picture of the shower after we finished the waterproofing. And here’s what the shower looked like after Steve tiled it. The Tile-Basin® is a great custom shower pan and available over on Bathroom Repair Tutor. 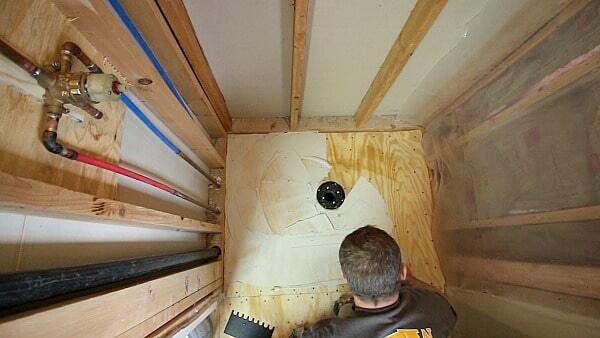 Our next tutorial shares how we installed the mixing valve in this shower. Thanks as always for reading, watching, and making HRT a great place for DIYers. The perimeter wall or material of the pan should go up the wall a few more inches to allow the vapor barrier to do its work. 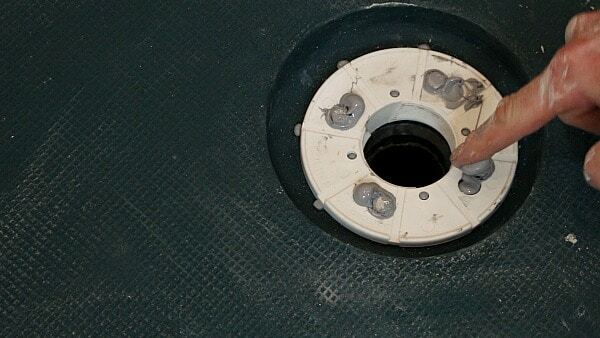 Also, it might help if the pan’s hole has a small 1/2″ to 3/4″ sloped wall going into the hole. Thanks Eric for your comment, the not all showers will require a plastic vapor barrier. In fact, one wasn’t necessary with this GoBoard on the interior walls. We furred out the walls with 1/4″ plywood and that allowed the GoBoard to sit down in the pan and be sealed using the PolySeal. I’m intrigued by the GoBoard material. Is this used in place of or as an alternative to Durock and RedGuard sealant paint? Look like it would be easy to handle by yourself. 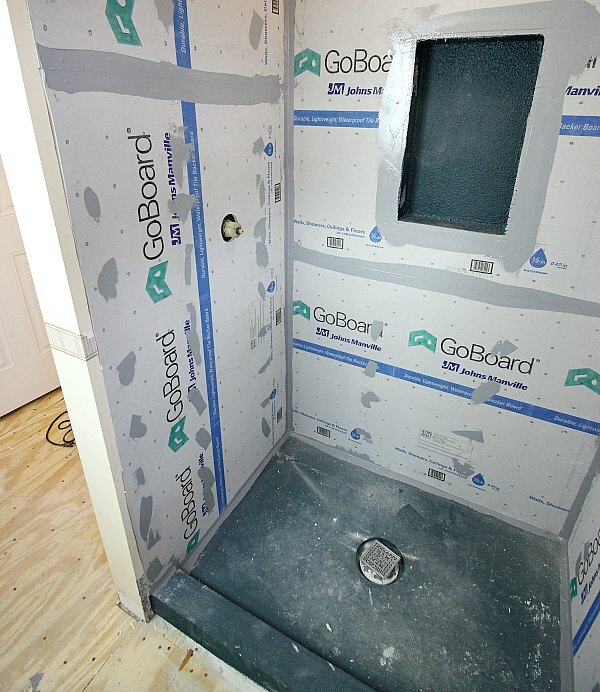 You’re right, GoBoard® can be used in place of cement board. The cost isn’t bad at $20 per 3×5 foot sheet. You’ll need cement board screws and the sealant for them plus the seams but it’s very light. We’ll have a tutorial on GoBoard® soon. Wondering if this base would work in a basement on concrete floor? What do you think? Yes, Jeff please let me know what the best way of buying this base is. If it can work on concrete floor in my basement I would really like to look into getting one. The great thing is that if it`s as easy as Steve made it look like, then I`m gonna consider getting another one for my upstairs bathroom when start that whole remodel. Concrete and Masonry surfaces must comply with ANSI A108.01 Section 3.2. Hope that helps. This pan was super easy to install, basically everything you see in the video is what we did. Let me know when you you’re ready to get the pans and we can help you. That really is quick. I love DIY and work in the trade of industrial ladders. I doubt however that I would be able to complete this in 2 hours. 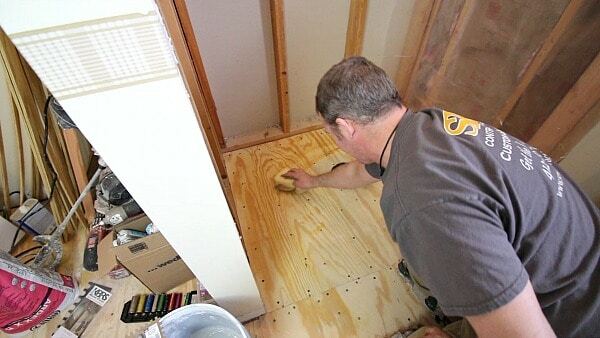 You might surprise yourself, if your subfloor is prepped and level this is very quick. The two hours was for installing the Tile-Basin® and the GoBoard. The pan itself only takes 30-45 minutes max. You can bookmark the page Larry, that’s the easiest. Or join Bathroom Repair Tutor if you’re doing a complete bathroom remodel as it has all our lessons in one spot. when using 1/4 firing strips how is the backer board gonna be flush with existing drywall?